Real apple cider vinegar is made by fermenting pressed apple juice until the natural sugar turns into vinegar. The apple cider vinegar you should use is the raw, organic, unfiltered, and unpasteurized kind of apple cider vinegar with the mother. Not the refined kind. Only the good quality kind of ACV contains the “mother” of vinegar, which is the cloudy stuff that sinks to the bottom of the bottle. This substance contains the beneficial enzymes, bacteria, pectin and trace minerals that makes apple cider vinegar so good for your entire body (and not just for your skin). You can purchase apple cider vinegar in your local supermarket or you can easily make your own natural ACV. Just remember to shake the bottle each time before using ACV to distribute the nutrients. Apple cider vinegar is effective when taken internally and also when it is applied to the skin externally. There are a lot of people who use apple cider vinegar as part of their daily skin-care routine to get rid of acne, reduce age spot and fine wrinkles, and to cleanse their skin. Using apple cider vinegar as a skin toner is a cost effective and natural way to keep your skin feeling fresh and supple. Here are some of the best reasons to wash your face and cleanse your skin with apple cider vinegar. Washing your face daily with apple cider vinegar can help to reduce age spots and create a more even skin tone. Apple cider vinegar contains powerful alpha hydroxy acids to help remove dead skin cells and reveal a fresher and healthier complexion underneath them. Many expensive commercial face washes bang on about the tiny amounts of alpha hydroxy acids they’ve added to their products, but ACV is full of far higher levels, of which are alive and ready to revive your skin. The ‘natural’ ingredients in commercial face products are actually dead and useless by the time they are processed and bottled up. When you use apple cider vinegar to reduce age spots, apply a little undiluted apple cider vinegar directly onto the age spots with a cotton wool bud and leave for about 20-30 minutes and rinse your skin with cold water. Repeat once or twice a day to get rid of brown spots on your face as well as other skin areas. Repeat the apple cider vinegar treatment for about 6 weeks to see if you notice any improvement. Apple cider vinegar is an excellent home remedy for treating and clearing acne, pimples and blemishes. During the creation of apple cider vinegar, substances such as acetic acid are formed, which give ACV antibacterial, anti-fungal and antiviral properties. Its antiseptic and antibacterial properties prevent acne or pimples by keeping the skin pores free from bacteria, and skin infections. You can find more information in my article about the 5 research based reasons to use ACV for acne where you can find various applications containing ACV as well as other ingredient to help clear your acne. ACV’s natural goodness also unclogs skin pores and allows your skin to breathe properly, so it is very effective in treating acne and pimples on your face and on your back. Apple cider vinegar doesn’t just effectively remove excess oil from your skin, it also helps to balance your skin’s pH levels. It can also prevent your skin from becoming too oily or too dry by balancing the production of sebum to prevent acne and pimples. Washing your face with diluted apple cider vinegar may help to minimize the appearance of fine lines and wrinkles. Just mix equal amounts of apple cider vinegar and water. Soak a cotton bud or cotton cloth in the diluted apple cider vinegar face wash and dab on your skin. Rinse with warm water and pat dry. You can use apple cider vinegar (ACV) to help reduce redness on your face. The acidic properties of ACV help to disinfect the skin from germs that can cause inflammation and redness. The low pH level of vinegar also aids in reducing skin itchiness and irritation. Some people claim that regular use of an apple cider vinegar wash can help draw toxins out of your skin leaving a youthful and clean glow. But remember that you can also use ACV internally to cleanse and detox your entire body. By consuming ACV internally as a natural detoxifier, you help your body to get rid of free radicals and other harmful toxins that contribute to acne. ACV is strong stuff, so you are best to dilute it with water when you apply it all over your face. Don’t be naughty and use undiluted ACV on the skin. It is very acidic and can damage the skin. This is especially important when you use apple cider vinegar to wash your face. To make your own ACV skin toner, mix equal parts of ACV and water. You can get creative with your ACV solution. Try adding green tea, aloe vera gel or witch hazel. After a while when your skin got used to it, you can gradually increase the concentration of the ACV. It depends on the tolerance of your skin. Just make sure you shake it before you use it, so that the water and ACV are thoroughly mixed up. Before you wash your face with apple cider vinegar, it is advisable to test it on a small area of your face. Under the chin is a good spot, just in case you do get a reaction, then it’s not too noticeable! To apply ACV to your face, simply use a cotton bud and gently glide over skin to remove make-up, oil and impurities. Be careful not to get it in your eyes! If you are suffering from a breakout, then be warned it will sting your pimples. However, this should feel like a ‘good’ hurt, and not be intolerable. When you use ACV on your skin for the first time, after 5 minutes, it is a good idea to rinse it off with warm water. This is just so your skin isn’t too exposed to ACV on your first time. If you don’t get a reaction, then the next time you use it, don’t wash it off, and then you can build up your skin’s tolerance. It is best to apply the ACV toner at night as ACV can increase sensitivity to ultra-violet rays. Don’t leave your body out. ACV isn’t just for your beautiful face. If you suffer from acne on your back, you are not alone. Fortunately, Apple cider vinegar is one of the best home remedies for treating acne on the back. If you’re worried about how you’re going to apply it, then just use a spray bottle and you can also add a few drops of tea tree oil as it’s an effective acne treatment. Repeat the apple cider vinegar treatment daily to help your skin heal and reduce the number of pimples you have on your back. Moisturize your skin. To finish off your new fabulous ACV skin care regime, you can use a natural, chemical free moisturizer such as jojoba oil or coconut oil (read my article about the 10 secret ways to use coconut oil on your face) or whatever suits your skin. You can also use essential oils for skincare. Maintaining healthy skin is also one of the 70 habits featured in my e-book 70 Powerful Habits For A Great Health which will guide you how to take positive steps to improve your wellness and overall health. Nice & very useful site. Usually shared with me acquentices for their benefit as well !!! Use warm water instead of hot and the enzymes in the ACV will this be alive and not dead. More beneficial to your body. Try hot tap water, am to lazy to boil it, besides, makes it easier to drink. I heard about that as an immune system booster since ACV has been shown to stimulate circulation, purify the blood, and aid in detoxification of the liver. And I agree on using the warm water instead of hot or boiled. do you have any positive feedback or result? Very helpful. ..going to try it now. I always used ACV as a natural ‘antibiotic’ for my kids too. A teaspoon of honey in a little hot water, then add a teaspoon or two of ACV. Slug it down. I don’t like it much LOL. I agree, try using a straw. is this cleanser or something?? My face feels warm I just wiped it and kept it on 5 min and them rinsed with warm water. Will my skin get used to it? You need to give time and build it gradually. Ok thank you I got so scared. .I did realize after wards I was suppose to mix half water with theverything ACV. for acv cleansing should i let it stay over night in my face or just leave it for 30 mins? When you use diluted AVC with water for the first time, it is a good idea to rinse it off with warm water after a few minutes. This is just so your skin isn’t too exposed to ACV on your first time. If you don’t get a reaction, then the next time you use it, don’t wash it off and leave it for longer time, and then you can build up your skin’s tolerance. So you need to go gradually to see that there is no skin reaction. After several days if there is no skin sensitivity, you can leave it overnight. You don’t need to store ACV in the fridge because of its high acidity levels. To preserve the quality of the vinegar, it’s best if you keep it in a cool, dry, dark place, like the pantry. I don’t know specifically about Dubai, but generally speaking raw organic ACV can be found in health food stores or online (such as Amazon). Try Spinneys. I got mine from there. Great information….I was consuming 2tbl spoons with 1tbl lemon juice in warm water to balance my blood pressure because I’m not on any medication….I was wondering why I was dropping a pound here and there…..I was using it for one solution and was pleasantly benefited I other areas, even with my digestive system……Great stuff! I love that there is a natural solution for topical skin care! If it’s good enough to put in me, it’s going to be safe to put on me. For what it’s worth I also make a tea with ACV and honey to drink the in mornings. Aside from being delicious I think it’s health benefits are well worth it and it’s an easy way to alkalize my body. ACV is great and has so many uses, I learn more every time I read about it, thank you for this article! This is a type of vinegar made from crushed apples or apple cider in a fermentation process. If you want to buy raw organic unfiltered ACV and can’t find it in your supermarket, try health food stores or buy online (for example Amazon). Hi….I don’t get raw ..organic….I got filtered. …does it works ?? One of the main concerns regarding refined ACV is that the heating of the pasteurization destroys the health-enhancing properties of the ACV. In this case, I’m not sure if it still contains all the substances that are beneficial for the skin, such as the alpha hydroxy or malic acids. Trader Joe’s has a good ACV with “Mother”. Bragg’s is another good one…available at most grocery stores. So many uses for it. Check out the “Earth Clinic” website. Where can I buy this kind of raw, organic, unfiltered, unpasteurized ACV in the UK? Hi Portia, you can buy it in health food stores or online through Amazon UK. I have been using ACV after I wash my face for about 3mths now. It defiantly burns at first. This is what I found to be helpful. Wash your face and let completely dry. Apply like a toner and expect stinking and redness. (Prepare yourself because Immediately hidden blemishes will begin to surface) I use a blow dryer on my face (on cold) to alleviate the stinging. The blow dryer allows me to reapply as many times as I like. I AM LOVINNG THE RESULTS I’M GETTING!!! i wonder if the burning is the acv cleaning the pores out. Hi Sheila.. Did you put some water in your ACV toner? What are your results!? If you don’t mind me asking. Been using this stuff for years , it really helps if you haven’t bad heart burn or acid reflux. It burns worse at first for a moment but after the burn goes away so does your other symptoms as well. I take it straight but its good to mix with a bit of water if you can’t handle the burn. I wouldn’t take more then 2 table spoons a day because of the high acid content. But the thing is when you get acid reflux its due to lack of acid in body , so by adding in this acid you get a proper level and thus eliminates your problem. You should NEVER take undiluted ACV internally. Depending on skin sensitivity, it may be ok externally, but must always be diluted for internal use; in fact, something like 1 Oz ACV to 8oz of water. Nonesense I have been taking undiluted adv internally for 10 years. Not nonsense!!! It is very bad for your teeth to drink non diluted ACV!! I’ve read that ingesting ACV at a very young age may not be really recommended, but I don’t know exact age. Also because you add honey to the mixture, honey can be given to children over the age of one year old because can contain spores of a bacterium called Clostridium botulinum, which can germinate in a baby’s immature digestive system and cause illness. These spores are usually harmless to adults and children over 1 year old. Hey. I am 17 years old. And i just cant get my hands on the organic acv. But i have the filtered one. Could i still use it on my skin? I mean, how does the mother matter when you use the acv externally? Refined and filtered ACV doesn’t have the same health benefits and nutrients that raw ACV has, hence will not yield good results. The refined ACV has undergone pasteurization and is free from the mother. One of the main concerns with processed and refined ACV is that the heating of the pasteurization destroys the health-enhancing properties of the vinegar and its enzymes. If you cannot find raw ACV in health shops, you can order it online from places like Amazon. You said you can’t get your hands on it… Why is that? Can’t get to the store, no job (I saw you’re only 17), can’t find it or don’t know where to look… Anyway, the brands I’ve used are Bragg’s and Spectrum. Bragg’s is pretty easy to find at Health food stores and places like Whole Foods, Fresh Market, and co-ops. I got a 32 oz bottle of bags at Whole Foods last week on sale for $4.99. They make smaller and larger bottles and as long as you’re not getting a gallon, it will run you about $4-7. Being 17, I’m not sure if you have a credit card or way of ordering things online, but if you can’t find it in person, Amazon has it and so does Luckyvitamin.com. If there is no one who can or will order it online for you if you can’t do it yourself, you could always buy yourself a gift card to Amazon at CVS or a grocery store and then use that to pay for it online. You just really don’t want something conventional like Heinz because then it is not organic and it’s pasteurized and all the good stuff is gone. You can find ACV in most health food shop like Holland and Barrett, make sure it is organic ect, it should not be ‘clear’ as it has what we call ‘the mother’ with it. Walmart has it in the same isle as the pickles, it is about $5.69 a bottle for the Mother Braggs. You can order ACV witH the Mother direct from Braggs.com. they sell one with honey already in it which I can’t seem to find in stores by me. Good luck! hello.. I just have a question.. What is I dont have pimples on the face.. Is it good to use ACV? ACV is good as a facial cleanser whether you have acne or don’t have. Hi folks, im a paramedical esthetician with 20yrs experience.There are many wonderful uses for apple cider vinegar, however, just to put it straight on your facial skin is not a good idea, especially if you have certain skin issues such as rosacea, seborrheic dermatitis, and many other skin conditions that the high acidity could make worse. Be careful, dilute it well, and use sunscreen. Also, using a blowdryer on your face is not a good idea. ACV is great wart remover though! This is why it’s emphasized in bold letters in the article not to use undiluted ACV on the face. To use ACV for warts click here for the directions. A friend of mine has a daughter that is a nurse. I had a skin tag under my eye that has been there for years and I hated it. I have a tmciupme tiny ones on my neck as well. She told me to put on a q tip and apply at night and I T he morning. After doing 3 days in a row, the skin tag under my eye fell off!!! I am so excited. I have just started concentrating on the ones on my neck hoping that in a couple days they will be gone as well!!! Hi there, read a post from 2016. Do you use full strength on q-tips for wart removal? My husband has wart on back of neck near hair line. Thanks for advice. How can I apply it on my face in order to remove pimple marks? And should I wash it off after applying or let it remain as it is? Apply the diluted ACV on a cotton bud and gently glide over your skin. When you use AVC for the first time, it is a good idea to rinse it off after a few minutes, so your skin gets used to the ACV on your first time. If you don’t get a reaction, then the next time you use it, don’t wash it off (best to do it at night). You can find another good application for pimples here. I am wrong by using acv as a toner after washing my face and then the cream ? You can use it like that too. I wash my face with castor, jojoba and olive oil. When should I apply the ACV? After or before the oil washing? Hi Tori, if you use the oil cleansing method which I wrote about in the past, then usually there is a thin layer of oil that remains on the skin and in this case I would apply the ACV before the oil washing. In this case you apply diluted ACV, leave it for a while (do it gradually to let the skin time to get used to it and to make sure there is no skin irritation). Then rinse off the ACV with warm water and finish with the oil cleansing application. If you have moles coming all of a sudden perhaps it’s best to see a dermatologist. I order mine from Swanson.com free shipping if you order $50.00 worth of products.I usally order vit.D,extra virgin coconut oil and other items. Diluted ACV is a skin toner which means that it cleanses the skin but can also control oily skin complex. Chronic oily skin can lead to breakouts and oily skin patches on the face. ACV toner can help control oil production and reduce the appearance of oiliness. if you have moles coming on your face, apply oregano oil with a toothpick only on the mole twice a day after first using a tiny amount of straight vinegar on the mole. the mole will dry up and fall off. What about flat moles/brown spots? Does it work for those too? Is it also good for black women? Iam worried its going to bleach my face and skin. Yes, ACV facial wash is suitable for all skin colors. It’s great and healthy for any skin tone. It works well on black skin. I’m a black woman and I use it as a facial toner as well as a rinse on my hair. I love the way it makes my hair feel and my skin has improved a lot I don’t have as many breakouts. Where would I get organic ACV in India thanks!! Generally speaking, you can find organic ACV in some supermarkets, health food stores or buy online from places like Amazon. It difficult to find BRAGG a brand name of apple cider vinegar here. I saw other brand name of apple cider vinegar in the super market.Does it acceptable if i used other brand name of apple cider vinegar? You can use other brands as long as the ACV is raw, organic and unfiltered. I just took my first dose, waiting for the benefits. I see that someone posted that you shouldn’t ever take ACV straight. That is how I would prefer to take it, is there a problem with taking it straight if you can tolerate it? Hi Stephanie, when you ingest ACV always use diluted ACV as it damages tooth enamel and can cause burns to the sensitive tissues in your mouth and throat if not diluted. Hi Murimi, I’m also in Kenya and got mine from Healthy U. I’m also aware of homemade pineapple vinegar. I don’t know if its as good as Bragg’s but I know it did wonders for my digestive system. Get in touch if you’re interested in the process. Is ACV helpful for acidity and diabetes. How to take it. As for acidity – I guess you mean acid reflux or heartburn – ACV is one of the most popular natural remedies for acid reflux, and this is strange, because how can it be that ACV which is so acidic possibly helps to relieve heartburn symptoms? After all, we were recommended all the time to avoid acidic foods if we suffer from heartburn. Well, there are several theories about how ACV works for heartburn, and one of them is that ACV aids digestion by helping break down fats, but regardless of how exactly it works, many people have reported about the effectiveness of ACV. It is recommended to mix one or two teaspoons of ACV with a glass of water and drink before meals or when heartburn strikes. Its wow.. just wanted to try .. can u please help me whr can i buy this in kerala..cochin..
Generally speaking, raw organic unfiltered ACV can be bought in some supermarkets, health food stores or online (like Amazon). Some references claim that the acidity of ACV can aggravate gastritis as it is very irritating to the stomach lining. I would consult with a doctor before consuming ACV in your condition. Hi Lynne, I’ve seen several references that ACV can improve keloids (see more information here), but I don’t know how effective it is as I’ve heard that keloid scars are quite difficult to treat. Lynne, tea tree oil completely healed my keloid. It’s still a bit dark, but no bump anymore. How many parts acv to water should you use for the face? To make your own ACV toner, mix equal parts of ACV and water. After a while when your skin got used to it, you can gradually increase the concentration of the ACV. It depends on the tolerance of your skin. Before you use ACV all over your face, it is advisable to test it on a small area of your face. Yes, it is. But you need to give enough time to see results – usually a couple of weeks. It’s not a quick fix, and patience is required. Also results vary between different people, but it worth a try. On a website I came to know that ACV reduces the size of keloid scars.Is it true? How can I apply or use that ACV on scar?? I’ve seen references that claim that ACV can improve the appearance of keloids, however I’m not really sure how effective it is for keloids, as I know that keloids are very difficult to treat, so I don’t know as to what extent it can improve it. In WikiHow website it is said to dilute a little ACV to half strength with water and apply it directly onto the affected skin. Then massage gently until the ACV is absorbed. They recommend to continue to apply the ACV on a daily basis over the course of several weeks, until the keloid scar reduces in size. I guess it worth a try but I don’t know how effective it is with keloids. Hi Jenny, thanks for the detailed info on ACV. I have active acne and lots of blemishes. Can I use it twice a day as a toner and then use some night cream during night? Thanks ! I,m 50yrs, What night cream can I use if I if I have pimples (acne)?? On my cheeks I think it might be my hormones! my skins sorta dry & oily in some areas but I don’t know what to use. It’s been off & on for 2 years I don’t know what to use. Jenny I want to try this on my face & as a detox! I use apple cider viniger in every morning before breakfast.its very good for me.especially for my asthma.its very good for asthma patient.doctor advise me use inhailer for asthma.i never use inhailer.after using apple cider vineger my asthma is totally gone.i was serious patient of asthma. For moisturizing acne prone skin, use one teaspoon of your preferred carrier oil (like jojoba oil, sweet almond, coconut oil etc) and add to it 2-3 drops of tea tree essential oil which is considered to be top oil for acne treatment. Apply it every evening before going to sleep and massage into the skin. Another option for a night cream is to apply pure aloe vera gel which has moisturizing properties and is also good to treat acne. Thank you Jenny for the aloe Vera gel night cream suggestions can’t wait to try it , is there a special kind to use? Try to find 100% organic pure aloe vera gel product – read the product label to see what it contains. It should mention the percentage of the aloe vera content – The higher is the better. Hi Jenny, thanks for all the information. I have melasma, will ACV help? I used it for a week and liked it. is it okay to use it daily for a long time. Hi Reema, melasma is quite difficult to get rid of and it can take quite a while before you see improvement. You can try using diluted ACV on your face on a daily basis for a long time. Give it time to see if you notice any improvement. If not, you can try other suggestions (see here) or try this mask. hi i have warts on my face under my eye and small ones all around my face i was wondering where can i find this acv in south africa stores can i only apply at night or day, beacause my doctor told me its oil gland therefore i must not remove it but its working on my nerve i work as a waitress some customers dont like me to serve them need help urgently pleeeeeeeeeeeeeeease!!!!!!!!! Hi Karin, as I’m not a doctor, you need to follow your doctor’s advice or get a second opinion from a dermatologist before attempting to remove anything from your face. Is Apple Cider Vingear good to help reduce gallstones? I have been suffering from gallstones and have been looking for a natural home remedy? Also is White House Apple Cider Vingear good to use? I’ve seen several references that ACV can help with gallstones – see here. Most of the references talk about ACV, however I’ve seen some references that mention white vinegar as well. OK thanks a lot Jenny!!! So to make a concoction for my face and want to add witch hazel would it be ewusl smounts of ACV, water and witch hazel? To remove age spots i would use it undiluted, correct? To make your own ACV toner with witch hazel, mix equal parts of ACV, water and witch hazel. After a while when your skin got used to it, you can try and gradually increase the concentration of the ACV. It depends on the tolerance of your skin. Hi, I have inflamed rosacea and acne meds dont work, do you think ACV will help? Hi Diana, there are quite a lot of references about the benefits of ACV for rosacea when applied topically or ingested, and I’ve seen a number of testimonials in rosacea forums of people saying it had helped them, so I guess it worth a try. You’ve got nothing to lose. To learn more about it click here. i’m taking med.for my high blood,is it safe to drink acv with honey?thank’s and more power!! Hi Daisy, you can have a look at webMD website for ACV interactions with other medications, as well as this website. I also believe you need to double check it with your doctor (I’m not a doctor) to be on the safe side of things. Thks Jenny for this nice info. Pls is Bragg ACV unpasteurized and unfiltered? Cos I want to buy it if it so. Bragg’s ACV is a well recommended brand and they sell raw organic unfiltered ACV. Is ACV effective for my hair loss,? Hi Miradoni, for more information about this topic please refer to my article “Why You Should Wash Your Hair With Apple Cider Vinegar“. Other related articles are: “How to Use Rosemary for Treating Hair Loss” and “How Castor Oil Can Improve and Regrow Your Hair” and “How To Make Onion Juice For Hair Growth & Strong Hair“. can the acv toner be used for treatment of hypertrophic scars? I’m not really sure. Hypertrophic scars like keloids are quite difficult to treat, so I don’t know if you get a good result. At risk of sounding crazy, I’ve heard coffee beans is good for your skin… But I doubt it. But my question is… Do you think mixing apv with water andbmaybe a tablespoon of cofee a good idea? Ground coffee is often used in various skin scrub recipes so I guess that adding it to the mix can help exfoliate the skin. Can acv correct hommonal imbalance? Like high prolactin. I’m not sure Tina. I couldn’t find information about it. I suffered from PCOS Cystic Acne, i saw the best dermatologist, i try expensive beauty clinic, for nothing…they said its cause the hormone. The i ran on a post at pinterest about ACV. I used it as night toner dilute 1:1 with water. (And use aloe gel as moisturizer) My acne gone faster, and it help prevent further acne. Now i only have one-two acne per months, near my period. This is so encouraging to me! Pcos runs in my family and I am going to get tested next week. I have many of the symptoms, unfortunately the terrible cystic acne is one of the worst to deal with! I’ve been applying the 1:1 toner morning and night after I use 10% sulfur ointment and rinse it off. I just use cerave gentle cleanser and moisturizer. I feel like it is bringing more to the surface and I’m hoping it is just a purging phase. Can anyone speak to this? I would love to find a natural solution because I’ve been on most other options for acne via a dermatologist and the ones that work best for me either give me rashes/puffy lips and/or I can’t get pregnant while using them. I would appreciate any advice, testimonials, or other replies with your thoughts. My acne is mostly cystic and on the lower third of my phase so I believe it is hormonal. It works for skin tags (see more information here). It can also improve hyper-pigmentation and lighten the skin over time, but if the spots are very dark than it won’t help. I have had great success with a skin tag!! everyone is different but i definitely think it is worth trying. i would add a few drops of a citrus oil like lemon or grapefruit which are known to lighten skin and even complexion. spritz a mixture of half water, half vingear (honestly you can use apple cider or regular white vinegar…in my opinion most of the benefits of the vinegar on skin come from the acidic qualities, not the live cultures) and a couple drops of the oils over your chest. massage well with your fingers for a couple minutes. then rinse of in the shower. avoid sunlight in this area and if you are going to be in the sun, use a zinc/mineral sunscreen, NOT a regular chemical sunscreen. hope thie helps. So when you use the ACV toner for the first time, you should wash it off after about 5 minutes? And then if it doesn’t irritate your skin, the second day and the following days.. Do you just leave it on overnight and wash your face in the morning? Yes, start with 5 minutes at the beginning and gradually increase the time. If no reaction occurs, you can leave it overnight and wash it in the morning. If you have hard water make sure you spritz a vinegar solution over your entire body and gently exfoliate with your hands. The vinegar gets rid of the excess oil, dirt AND the hard water deposits. I always thought I had dry skin and would feel that awful cracking feeling on by back after a shower. Then I stopped using so much soap, which is pretty much exclusively used for my nether-regions and underarms now, and started using a vinegar spritz and a shower-head water softener…and I can’t express how different my skin is. My elbows are smooth, my shins never get dry, my back is blemish free and dries without discomfort. I just turned 30 and now use vinegar to cleanse my face too…being very careful I even get my crows feet and brow region. The immediate smoothness of my skin was unbelievable. And it takes A LOT longer for the dead skin to build up, so I don’t even have to use the vinegar every day. I have coarse, curly hair, and I yep I use it on my hair too. Softens, reduces frizz and build-up, and increases shine. My beauty routine has become so simple and effective and honestly I can’t believe I lived 28 years smearing soap scum all over my body every day and wondering why my pores were clogged and my skin always felt like the mantle of the Earth. Like the author said, you can add essential oils, especially if you hate the smell of vinegar. But if you spend any time in direct sunlight (I hope you do), it’s best to leave the oils out of your regular routine. They are very sensitive to light and will damage your skin and hair. They’re good for a “spa day” every once in a while when you can intentionally stay out of direct sunlight for a while. If you can’t find a health food store that sells it, I saw that eBay Australia sells it online. Hi Jenny, can I use ACV in any smoothie? Yes, you can. You can also read my article about How to Make Apple Cider Vinegar Detox Drinks. I have suffered from Perioral Dermatitis around my chin/nose for a little over 4 years. Mainly after/during pregnancy. I used cream after cream from Dermi’s, OTC, dept stores, anything I thought could remotely control, cover up, or diminish the redness and flaking I had. It’s not acne, it’s like little clear fluid blisters that burn and I swear spread if messed with. Then they leave this crusty, flaky, unsightly rash on your face. Year after year I battled it. I was able to cover it up but that just meant more product and hours doing… I’m a mom, ain’t got time for that! I started using the ACV by itself and within days it was ALL gone… I also discovered I had an allergy to SLS (Sodium Lauryl Sulfate). Finding products WITHOUT that is nearly impossible. (Look into that for skin conditions as well!) anyways… So I cut that out buying sulfate/parben free products. But in May while traveling couldn’t bring my expensive stuff so I looked around at everything in the travel bins… Noxzema had no SLS so I figured for a few days it wouldn’t hurt. Any dryness leftover from the PD I had (blisters were gone but dryness lingered) was gone OVERNIGHT!!! Ever since then, my name brand moisturizers, primers, concealers, toners, cleansers… They’re all in a bottom drawer not being used. A big tub of noxzema $3.88 Walmart. Bragg ACV $3.75 that set has lasted me well over 3 months and I still have plenty! I put my ACV in a flip top bottle top mixed with equal parts distilled water and just for fragrance I put about 10 drops of lavender essential oil in it. Lavender helps with acne though by reducing redness and swelling so it’s a 2 in one plus smells great and masks the vinegar!! Whew that was REALLY long!! Hi Jenny! Before reading your article I decided to use some straight acv on a few pimples I had on my chin/jaw area (a result from using store bought moisturizer containing sunscreen…always clogs my pores). I have acv and heard of its many great uses and wasn’t sure but I thought I heard it was good for acne. I thought what the heck. It’s worth a try. I had just tried squeezing one of the pimples because I thought there was stuff in there… so it was red, puffy and irritated. I took a q-tip and dabbed it on full strength. It burned but I thought “good…get those suckers!”I kid you not, in about 5 minutes or so the burning stopped. A few minutes after that I looked in the mirror and was amazed. The redness was gone and the puffiness was about half what it was. I had to immediately tell my teenage boys. This stuff is amazing!!! On the subject of skin… is there any natural product that is good for fighting wrinkles and if so, how is it applied and how often? Hi Christine, I’m not really familiar with the benefits of grape vinegar. I’ve found a reference saying that it eases discomfort of skin irritations but couldn’t find information about grape vinegar and hyper-pigmentation. You can use the ACV itself as a cleanser and a toner. If you suffer from acne, you can add to the solution witch hazel or aloe vera which are good for acne. As for moisturizing acne prone skin, use one teaspoon of your preferred carrier oil (like jojoba oil, sweet almond, coconut oil etc) and add to it 2-3 drops of tea tree essential oil which many consider it to be the number one oil for acne treatment. Apply it every evening before going to sleep and massage into the skin. Hii.. I want to try it. Please tell me which one to buy as there are many options in market. Which company ACV is the best one for skin and intake in body. When buying ACV, it needs to mention on the label that it is raw, organic, unprocessed ans with the mother. A good brand that is recommended by many people is Bragg but you can use any other brand that meets these specifications. I got blood from the pimples after applying ACV, is it normal ? It might be that the ACV was not diluted enough and perhaps it was too concentrated and irritated the skin. Start from a well diluted ACV and leave it for a short period of time on your skin and see how your skin reacts. Hi Alka, you have all the information in the article under the headline “How to use apple cider vinegar to cleanse your skin”. This is more suitable for dark spots but less for wrinkles. For wrinkles you can try this turmeric face mask for improving the appearance of the skin, this essential oil blend, or oil cleansing method. Love this site. Great information. Thank you. I’ve also used ACV (Braggs) for my ovarian cyst that I had a few years back. That and changing my diet to an alkaline diet totally shrank and got rid of that cyst AND the fibroids I had. Look into it folks. It definitely helped me. I believe that on a regular use you can find your sun tan removed to a certain extent but you lose your tan anyway along time. The outside layer of human skin replaces itself every 28 to 30 days. Cells on the surface continually flake off over time and new ones grow in the bottom layers of the skin. If you don’t want to remove your tan, apply it for a shorter periods of time. As a side note, it is best to apply the ACV toner at night as ACV can increase sensitivity to ultra-violet rays. Please let me know, how ACV can be effective for Psorisys and the required dose for the persons suffering from Psorisys. How it can be applied? Have a look at my article about natural treatments for psoriasis under number 2. Thanks… Can I put ACV every night on scalp as well because I wash my hairs on weekends. Is it advisable to apply ACV every night without washing hair? Hi Sanj, people usually apply ACV on the scalp to treat problems like dandruff or psoriasis. You don’t apply pure ACV but equal parts of ACV and water. Leave the mixture for about 10-15 minutes and wash off with warm water. Don’t use shampoo after applying the ACV. I wouldn’t leave ACV on the scalp for the whole night without rinsing it (see my article about ACV for dandruff). You are sooooo Knowledgeable and Helpful. Just wanted to let you know it is appreciated. 1st review ever!! OH My God , I feel like an idiot for not trying this earlier, excuse my rambling but I’m very excited, I thought it was the most ridiculous thing I ever herd, though of smelling like a salad ect. I am in the Architectural / engineering field and I am highly into research / latest technology I follow the most recent medical developments ect. I have been suffering with acne in my T-area and cheeks , jawbone since 18 yrs old and I am now 46. I come home from target yesterday with a bottle of ACV and distilled water to try it out all for 8 bucks, I just paid $327 for a tube of useless soolantra waiting to get reimbursed from my insurance by next week because required a prior authoriz. my wife was like ” what are you doing ” I mixed a 50/50 potion and locked myself in the bathroom for an hour, yelled out to her if I’m not out in an hour call the paramedics. I have extremely sensitive skin on my T-area so I thought I was going to have a bad reaction but I’ll try anything once. I have tried every kind of cream for 30 years to no avail , derma was pushing accutane but I have heard some terrible things and I have 3 kids to raise, the fact that your oil glands can grow back to normal after accutane discourages me from trying it. So I applied the ACV mix with cotton balls, stung a little but that’s nothing compared to creams I have had adverse reactions to. I have been hospitalized twice for an out of control pimple that almost took over my head. In one hour the redness in my T-area went away about 90% , face felt refreshed, oil under control, my skin would be oily in a half hour after washing with all kinds of soaps before, tried moisturizers after washing but face would get really greasy. Its been 18 hrs since I applied the magic potion on face 3 times I have used no soap, skin gets a little oily now but no where near like it was prior, Guess it’s true about the PH / Skin Mantle / Acid ect. First time in 30 years I have woken up with no new bumps, terrible oily skin, or swollen T-area and of course the pimple or cyst of the day special. This has to work for me because nothing else has ever worked. I plan on having a long talk with my derma and her staff ( hate her staff even more ) I’m going to make a scene in her waiting room , waiting for what? So we put a man on the moon in 1969 with a computer that was less powerful than my 9th graders calculator and we cant control acne? ACV is an ancient treatment for all kinds of ailments. OOps there’s insufficient research and drug companies cant make a dime, cant prescribe ACV because you’ll never come back to my office and pay $150 bucks at a clip for 15 min, $300 creams? Its ok to pay for the stuff if works. ACV cost me 6 bucks, overpaid at Target because I’m in NY. The thought of being prescribed stupid creams and medications that will make you grow an eyeball on your liver is horrifying. I am furious with current and previous dermatologists, but at the same time very happy. I cant believe the results in 18hrs, got my face back, no embarrassing redness, the doctors couldn’t even tell if it was Rosacia. I’ll post more results in 3 weeks. I plan on taking 2 tablespoons with 8oz. of water 3 times a week, as others had success with for internal use, try to funnel it down because it’s not good for the teeth, then again Halloween is coming, If you are suffering try this, I can’t believe it worked for me. thanks for reading. started Taking 2 tablespoons with 8oz glass of water for now twice a week. Would love to hear your results! Good luck! Raw ASV is great for your hair etc.You can purchase it at any WallyWorld,most groc stores to. The reason so many people use Bragg ACV is because it is raw, organic, unprocessed and unfiltered. But you can use any other brand that has the same specifications. Been using filtered ACV to treat flat warts on my daughter’s face for the past couple of months. It works exceedingly well – the DR did not want to treat them with beetle juice or freezing, because of possible scarring, so he suggested looking for alternate methods to get the body to reject the wart virus. I did not believe ACV would have any affect when we started, but I’m sold now. Truly amazing recovery in 2 months after 3 years of dermatologist and pediatrician consults. We used the filtered stuff because that’s what I had in my pantry at the time. Unfiltered may work better, but this is doing the trick just fine. Can i use American Garden brand and Heinz? Because thats the only available Apple Cider i get to see here in our supermarkets? As far as I’m aware of, the ACV of these brands is not unfiltered and unprocessed. Many people choose Bragg ACV which is raw, unprocessed and unfiltered. It can be found in health food stores as well as online. It can aid in better digestion and weight loss but it will not provide you with a quick weight loss solution and should be combined with other methods, such as proper nutrition and exercising. It is not a magic solution for weight loss, but an add-on to help in the process. If you are already lean, I don’t believe that 1 tbsp. will make you lose more weight, but will help you to maintain and manage a proper weight. As for skin – I’m not sure if consuming ACV internally will give you the results you want, but you can use it topically as suggested in the article and see if there is any improvement to your skin complexion. Is it safe to ACV on your face if you have rosacea? If so, full strength or diluted. Thanks all. Never use full strength ACV on your face. Read more detailed instruction and caution notes in my article about The Best Natural Remedies for Rosacea – number 4. Can I use other brand of ACV, like Heniz ? The ACV needs to be raw, unprocessed and with the mother. As far as I’m aware of, Heinz is a processed product. Try to find Bragg ACV which is a good brand. You can find it in some supermarkets, health food stores or online. I have melasma on my face. Will applying ACV to the affected area help? Do I apply full strength for the 20-30 minutes or dilute it? ACV may help (depending in the severity of the melasma and also results vary between different people). Don’t apply full strength on the whole face (unlike if you use it for age spot which is small). Start with equal parts of water and ACV and gradually increase the concentration of the ACV (it depends on the tolerance of your skin). I personally tried this turmeric face mask for my melasma (I added also lemon juice to the mix). I’ve started to see improvement after about 8 weeks (the skin tone became more even), so as you can see it’s not a quick fix and patience is required. But again, everyone is different and it’s hard to predict the results if you don’t try and give it enough time. If the melasma is really bad, often home remedies will not yield satisfactory results, and you may need to consult with a dermatologist. Hi..i would like to ask, is it ok for me to apply like this? 4. Tea tree oil moisturiser vit e? When you use soap, use a mild soap that will not over-dry your skin. you can try different applications on the face and all of them are good for acne. There are no official guidelines as to what to apply on the skin, and if it works for you then it’s fine. Hi, loving the all the info about ACV but I didn’t see any post about light spots on the face. I’m a dark skinned black lady w/light spots, not the white spots/skin disease some black people have but just lighter spots on my upper cheek under my eyes and in between my eyebrows. Sometimes in b/t my eyebrows will get flaky, red, and itchy. If I use the ACV solution 1:1 will it cause my light spots to get lighter? I tried several things including Selsun Blue. Nothing has worked. Have not been to dermatologist yet b/c I know they’ll just put me on expensive creams or med. Also I have acid reflux and will try the ACV and warm water. Do I have to use honey or can it be substituted w/something else? Lemon? I don’t like honey very much. Hi Kristie, as for your first question – I don’t know. I’m not sure what exactly are the light spots you have on the skin. Usually ACV works to treat darker spots like age spots or pigmentation. Discoloration of the skin with redness, flakes and itchiness usually indicate infection or inflammation. Since I’m not a doctor, best to talk to doctor or dermatologist. As for your second question – Some people with acid reflux find that drinking ACV aggravates the problem (while others find that it actually relieves the problem), so start with a small quantity of ACV diluted in water and see how you feel. You don’t have to use honey. You can either drink it as is, or add a natural sweetener, such as stevia, blackstrap molasses or maple syrup, or add it to herbal tea. Hi,can I use as acv as a face wash. Then use acv as a toner. 10-20 mint later use a night moisturizer and leave it on all night until next morning. thanks for sharing. 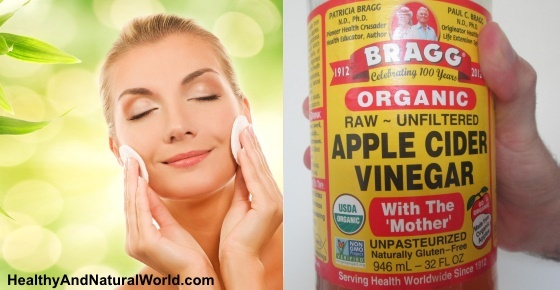 i want to try braggs acv, but i do not use any moisturizer of any sort on my face, as i have given up searching for one that will not worsen my acne. will it be ok if i wash my face and then apply acv wuthout following up with a cream. i await your respone.thanks a lot. If you have an oily skin complex, you may not feel that you need a moisturizer so you don’t have to apply one. However even oily skin can sometimes become dry (for example in winter time or if living in a dry climate). In this case you can apply pure aloe vera gel which is suitable for acne prone skin and is good as a skin moisturizer. You can also mix a few drops of tea tree oil with the aloe vera, as tea tree oil can help treating acne. I recently used ACV without diluting allover my face. I couldn’t tolerate it. It was so burning, i see the developing white spots, Immediately i washed off and applied Aloe vera. Next day those white spots turned red. I am super scared to use ACV again. But one of my friends suggested to dilute and use. I will have to try that. Hope it works. Any suggestions please ? I want to use ACV for my black spots on my face. As the article suggested, you need to dilute the ACV when applying to your face as it’s very acidic and can damage the skin. Follow the instruction under “How to Use Apple Cider Vinegar to Cleanse Your Skin”. You have all the details there. Hello Jenny. is it ACV help to loose weight.? and if so how to use it.? Read my article about How To Use Apple Cider Vinegar (ACV) For Weight Loss. Hey Jenny got lots of acne and dark marks on my face .have tired lot of things so please could advuce me how to USE ACV on my face.. Please. Hi Avi, you have all the instructions in the article itself under the headline “How to Use Apple Cider Vinegar to Cleanse Your Skin”. Another thing you can try is turmeric face mask – see instructions here. Add to the face mask a few drops of tea tree oil that treats acne due to its antiseptic properties. If your acne is really bad, you may need to see a dermatologist for further advice. hiii…i am from India & acv not very common here…so I give coconut vineger a try and i am using it for about 1 week,i used it overnight,but it ended up in giving 5 new pimples in my face….is this normal with a new user….plz give me a suggestion…!!! I don’t know much about coconut vinegar, but if you apply it diluted on your face, as the article suggests, and not full strength that can damage the skin, as well as for shorter time initially, I would not imagine it should cause pimples. But everyone is different, so I don’t really know. Whenever you apply vinegar, you must dilute it (at least equal parts of vinegar and water, and you may need more water to further dilute it) and start from applying it for a short periods of time to gradually build up your skin’s tolerance. If it still doesn’t work for you, you can try this turmeric face mask. Hey..I’ve got a bottle of apple cider vinegar but the filtered one…it’s a clear orange color solution..I know it’s not gonna work like the organic one because it doesn’t contain ‘mother’ in it but I can’t throw it now…I still wanna use it even if the effect is not as good as the organic one…. is it safe to use it? You can use it if you dilute it with water as per the instructions. Don’t apply undiluted ACV as it can burn the skin. You can still use the refined filtered ACV for other household uses instead of throwing it away. See here 10 household uses for vinegar. While it talks about white vinegar, you can use filtered ACV as well. I suffer from bad case of acne and been using ACV ‘mother’ diluted with water as a toner for few weeks. I usually use it after washing the face and applying it with cotton and putting moisturizer on after it dries. Is it safe? Will it in long term be good for my skin? I have seen reduction of Acne and it feels good; but ACV wont damage my skin in long term right? Also the moisturizer I use is ‘Lacto Calamine’ (Kaolin + Zinc Oxide + Glycerin). Is it alright to use it? or should I go for a wetter moisturizer like Aloe Vera? If you use ACV as directed then it should be fine for the long term. It is best to apply the ACV toner at night as ACV can increase sensitivity to ultra-violet rays. If you want another treatment for acne have a look at this turmeric face mask and add to it tea tree oil and lemon juice. I’m not familiar with Lacto Calamine, but looking in the web, it is used for mild cases of pimples and as a moisturizer for oily skin. I’ve seen it contains castor oil as well as glycerin, which are two ingredients that are commonly considered comedogenic. It also contains other additives such as emulsifiers, preservatives, permitted colours and perfumes. If you feel it works for you, then you can use it. You can also try aloe vera as a moisturizer, which is also good for acne and is water based, however with aloe vera products you need to read carefully the product label with the ingredients. Try to find a product that contains the highest content of aloe vera and the least amount of additives. Also opt for aloe vera that doesn’t contain alcohol. Aloe vera has a short shelf life, hence manufacturers add many preservatives to the product. I have just started using ACV diluted in water for my extreme eczema and it’s amazing to help with the extreme itchiness and flakiness! ACV is indeed one of the natural treatments for treating eczema. Hello old. I have some flaky skin on my forehead and neAR eyebrows. I’m not red at all. Just flaky skin. Hardly noticeable but I see it. Its winter now where I live so it’s cold. I have the mothers ACV. Should I put it on my forehead full strength? Will that remove the flakes? For some people the cold weather of winter brings uncomfortable dryness to the skin of the face. The problem can even become worse when the skin gets so dry that it flakes, cracks, and can even be inflamed. In your case you may only need to moisturize your skin more often. You can try using oil-based moisturizer rather than water-based, as the oil creates a protective layer on the skin that retains more moisture. I’m not sure if the ACV will help in this case, but if you want to try it, you should always dilute ACV as per the instructions in the article. You need to be careful when applying diluted ACV near the eyebrows as not to get it in your eyes. Hi Jenny, I have these fine circular lines on my face, specially on my face. I don’t know what’s causing them or how they’re called. They appeared like 2 weeks ago. And each morning I would notice some new lines forming. Can you please help me out. I’m not sure Meg what you refer to. I love ACV I did not know about the refined version and just buy it at the grocery store. I have been taking it internally with honey and warm water for bad knees and joints… I have now quit taking my hydrocodone and feel great. Actually stopped my trigger finger (thumb). I’ve been using ACV for a long time now. If I go without it for a while and my face breaks out, I apply it to my face, undiluted,any store brand and type, and within 3 or 4 days, maybe less, my skin is completely clear. Within an hour of application, i can already see a nice difference in my skin. I can attest to it working wonders with my relaxed, bleached-and-dyed-way-too-many-times, black girl hair. But, I mainly want to say that it’s not complicated. If you are at the dollar store and you see ACV, just pick it up, it’ll work. Not to refute anything in the main article– it may not work in the same way the “mother”, cloudy, organic type does (I wouldn’t know yet), but it works superior to anything else, so it doesn’t really matter, at least not to me! You will have clear, glowing skin within 2 weeks if you use it a couple times a day everyday. Oh, and I never wash it off either, I just wash my face first, then apply it all over my face a couple times over. My son have white spot in his face and lots of black heads is it ok to use undiluted acv? Lots of acne in his back. Please advice me what will i do. If i use acv how many minutes and can i put it over night or b4 taking a bath? Don’t use undiluted ACV as it can burn the skin. It’s a strong stuff. You can leave DILUTED ACV overnight, but start from a shorter period of time to make sure there is no skin irritation, and build it gradually. You can try other treatments for acne such tea tree oil diluted in a carrier oil, applying aloe vera or witch Hazel, but often severe cases of acne may not respond well enough to home remedies and require a consultation with a dermatologist. You can also refer to my articles about blackheads and DIY face wash for acne, pimples and blackheads. I used white vinegar and noticed the dark spot got even darker. Is this normal as a new user? I’ve never tried white vinegar and I don’t recommend it. Did you dilute the vinegar? Make sure you use diluted ACV and start the application for a short period of time as recommended in the article. can i use ACV on face daily????? You can use it daily. Don’t forget to dilute it with water. 1. Diluted ACV – the first method is to mix equal amounts of ACV and water and apply it directly to the eczema affected part of the skin by using a cotton ball or a spray bottle. If you have sensitive skin, dilute the ACV more. Remember to apply moisturize after using ACV because ACV is a drying agent. If the ACV is organic,raw, unpasteurized but lightly filtered I believe it is still fine (I personally use Bragg ACV which is not filtered at all). 2. Aloe vera gel – more information here. 4. Witch hazel – see more information here. 5. Natural butters like shea butter or cocoa butter. 7. Essential oils for eczema – see more information here. is ACV product available somewhere in bacoor cavite? and if not where can i buy it near my place now? It is available at SM and also you can order it in Lazada. I use acv by Heinz. Is it okay? Very helpful for weight loss though. If the product clearly mentions on the label that the ACV is unfiltered and with the mother, then this is the type of ACV that you want. Is it okay to keep a water+ACV solution in a plastic container (like those cosmetic bottles for lotions)? Or does it have to be in a glass container? Thanks! I couldn’t find any definitive information regarding storing diluted ACV in plastic container (and some people do store it in plastic bottles as it is more convenient. Bragg also have some of their ACV in plastic bottles, although it is a special type of plastic which is known as High-Density Polyethylene (HDPE)). I prefer and recommend using glass if you can. i will try it and give feed back, but can acv be used for cleaning throat? i do av dry through where i will be forcing the throat to be clear. You can consume ACV internally, and it has many health benefits. You can try ACV as well as some of these natural remedies for a tickle in your throat). Just remember that when consuming ACV internally, you must dilute it with water (1 tablespoon of raw unprocessed ACV in a glass of water and 1 teaspoon of raw honey). Never consume neat (undiluted) ACV as it can burn the throat and do more harm than good. I use undiluted BRAGG apple cider vinegar as a toner on my face day and night. I haven’t had a problem with the undiluted vinegar causing irritation or dryness. I have really oily skin though. I love the stuff on my pores ! I have two deep black heads o my next and am afraid to try to squeeze then they are a raised a little and are very noticeable, I was ill for a time and ignored them, but now am in immediate need of getting rid of them. WHAT CAN I DO, USE THE BRAGGS VINIGAR OR WHAT? PLEASE REPLY ASAP. GOING TO A WEDDING SOON. Also would Braggs be good to treat bird mites on the bites which are very itichy. As for the blackheads – the easiest way you can try is facial steam to help open the pores which is one of the best ways to get rid of blackheads. Boil some water and pour it into a large bowl. Put a large towel over your head and place your face over the bowl for 5 to 10 minutes to let the steam do its work. If you see that the blackheads have softened after the treatment, you can gently push them out, but don’t press or squeeze hard. You can then finish it of with one of these facial masks for blackheads and shrinking pores. As for mite bites – Please read my article about natural treatments for mite bites for more information.